I make this curry A LOT, but for some reason, this time, I barely switched anything up and it was the best curry I have ever made. Seriously. I could eat this everyday for, well for probably only a week, but still. I could eat this for a week. That says something. This recipe was originally from a Feb 2009 food and wine magazine that my parents had laying around the house, and I ripped it out and took it when I was living abroad to make (obviously). It currently resides in my ‘recipe folder’ which is this ridiculous plastic folder that we used to have to submit our thesis chapters in when I was doing my PhD over in London. Now it contains tons of handwritten notes, torn newspaper clippings with writing. Pictures. It’s kinda a mess. But it’s my bible. Most of my tried and true recipes either started or reside here, and I always pull it out when I can’t think of something to make. 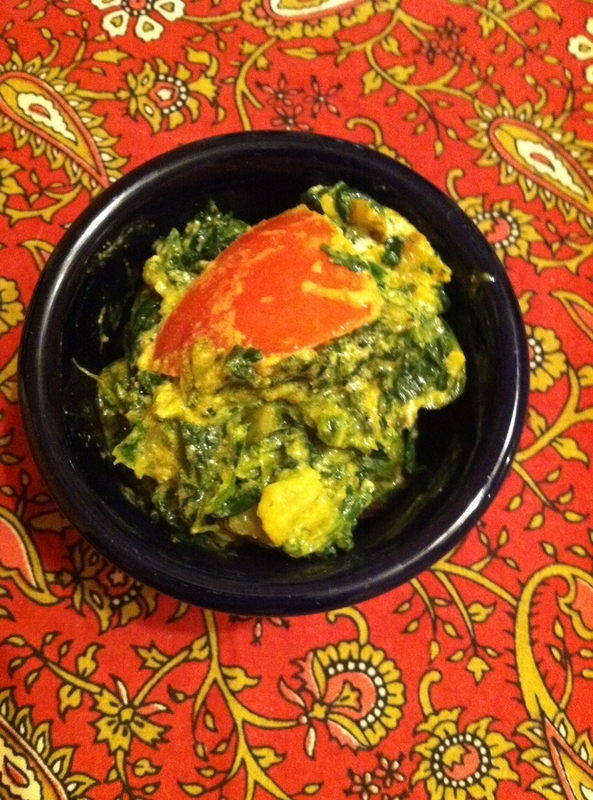 Anyway, so this recipe is originally called “Spinach Simmered in Yogurt”. I have changed quite a bit about the recipe, so if you look up the original recipe and make it…let me know how it is, I think the last time I made it that way was 2009. I have this weird aversion to sticking to recipes, unless they are baking, which seems more like an exact science. Anyway, I love this recipe. It’s easy, it takes almost no time at all to make and I’ve never made a bad version of it. Saute the onions, potatoes and garlic in the olive oil until the onions are translucent and the potatoes are cooked through. (8-10 minutes) Add 1/2 cup of chicken stock, scrape up any potato that has stuck to the bottom of the pan and let come to a light boil, reducing the liquid until it’s almost gone. (3-5 minutes) Add spinach and cook down until it is all completely wilted. (About 2 minutes) Add jalapeno, tomato, spices and the rest of the chicken stock. Cook until chicken stock is once again almost all gone, stirring as you go to combine all the spices and to make sure everything is cooking evenly. Reduce heat to low, stir in yogurt and cook for 3 minutes. Remove from heat and serve with rice.